As you know by now whether through President Obama's visits or MSNBC's resident bloggers, Elkhart County has suffered the nation's highest unemployment since last fall. 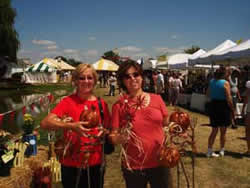 Today the 47th annual Amish Acres Arts & Crafts Festival opened with azure skies, a soothing breeze--as perfect glorious summer day as the festival ever sees. 300 artists from 28 states were in a bouyant mood. Shoppers set to go boothing were lined up at the gates. There was a air of optimism all around. Network news crews were there at the opening bell looking and lurking for their story. An unnamed network seasoned reporter found two women who said they were from New York State near Buffalo and have been coming to the festival for 14 years, driving 10 hours, and spending $600 to $800 each annually. The reporters first question was, "So do you plan to spend less this year because of the economy?" After several more baiting questions the women refused to fall for, I introduced myself and invited them to bring their packages to me and I would carry them to the car for them. Then I made my anger known to the reporter about his intent in looking for the negative while surrounded by as much positive as the area has seen in a year. Then network #2 interviewed me with the opening question of, "How do you think the economy will affect the festival?" I refused to answer the question; end of interview. Two artists standing nearby gave me a thumbs up. And so it goes. 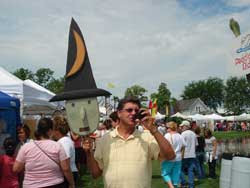 The 47th Annual Amish Acres Arts & Crafts Festival opens tomorrow at 9:00 a.m. 47th! A new vendor who came nearly 300 miles just asked me, "Is this a good show?" I asked what she meant by "good show." She said, "Well, does anyone come?" Let's see 47 times 50,000 is 2,300,000 visitors, discounted by 300,000 for those early years leaves us a net total of 2,000,000; so I said, "A few." Pastor Rick and Lois Jones from Michigan City, Indiana celebrated their 25th wedding anniversary in Amish Acres Restaurant today. That has happened before. 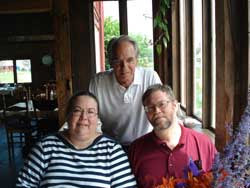 They, however, have celebrated each of their twenty five anniversaries in the restaurant at Amish Acres. That likely hasn't happened. They were greeted by Lisa who presented them with fresh cut flowers from the farm's gardens, a loaf of Amish Acres hearth bread and basket of goodies. This photo that includes your's truly was taken soon after their arrival and just thirty minutes after I wrote a letter to Mr. Esposito from Chicago who was extremely disappointed in our Sunday buffet two days ago. He likely won't be celebrating his anniversary with us, but every day we work at making Amish Acres special enough that the Jones return each year and add to their memories of this special place.